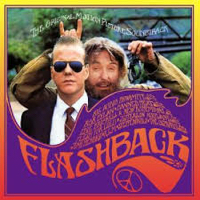 The movie [Flashback] produced a fairly popular soundtrack made up of a mix of 1960s and 1980s alternative music. The highlight is the theme song "Free" by the band Big Audio Dynamite which is only available on this soundtrack; it was never included in any Big Audio Dynamite album. A remake of the song, titled "Kickin' In", was later recorded by Big Audio Dynamite II and included on the Kool-Aid album. Bob Dylan's version of Curtis Mayfield's "People Get Ready" is also only available on this soundtrack as it hasn't been released on any Dylan album or any of his many box sets or Bootleg Series releases, although a different version that Dylan recorded in 1975 is available on iTunes as a bonus track on Bob Dylan: The Collection. Recorded and mixed by Larry Brown. Recorded 11/87 at 440 Studios, Glendale, CA. 5. It's the End of the World as We Know It (And I Feel Fine) - R.E.M.